At 49 years old, I was a manager in a non-profit organisation with a great salary, a company car, a phone and laptop. At 50, I became sort of motorbike riding gypsy, with no regular income. I spent the whole year travelling, exploring and living on an average of $100 a week. It was a magical year. I have always loved travelling and started at an early age. When I was three years old, my parents left England for New Zealand, the land of clean, green pastures, rugged hills, and described in my childhood as the quarter acre, pavlova paradise. I feel exceedingly fortunate to have grown up there. I took holidays to Fiji, Singapore and England in my late teens. I got married in Samoa, and lived there for a year, sometimes staying in homes with no glass in the windows, no flushing toilet and a shower that was a hose attached to a tree branch. Even when I had five sons, we managed a trip to Disneyland with a weekend In Hawaii and another week in Samoa. I loved being a mother but my marriage was always hard work. Finally, just before I turned fifty, and the second to youngest turned 18, I finally realised my marriage would never be any better and moved out into a flat of my own. I left my husband the house and children so he could continue his home based business. He repaid me by taking the youngest, who was almost 12, to Australia. I love New Zealand and it surprised me to see so many of my friends and family move to Australia. I thought it was just a bigger New Zealand, with koalas, kangaroos, giant spiders and poisonous snakes. I wanted to be closer to my youngest, so I decided to follow. Before I could set a date to leave, an alcoholic I met online began to cause trouble for me. He called the police to report me missing and then sent hate letters to my employer. Soon after, I was made redundant from my well-paid job. It seemed like the ideal time to go to Australia. Luckily, I had also met a wonderful Australian man while online dating. He was my physical and moral support as I left New Zealand to follow my son. I applied for a live in role at a health retreat but it was only two days before my flight that I received a call saying I could stay with them while they processed my application. The retreat was not what I expected and the job I applied for never materialised, but is set me up as an adventurer. Once I had made the leap, I decided to continue. After the generous gift of a motorbike from my friend, I began to travel thousands of miles on my own up and down the east coast and mid-western highways. I took up scuba diving again after a thirty year hiatus and began hunting for geocaches* in remote and diverse spots. To solve the problem of a place to live, I began to house sit. I moved into my first suburban home with one small bike bag and a backpack and began a new life. I stayed in 15 homes in one year. A dilapidated bungalow in the city, a recently constructed urban ghetto development, a Midwest country town, and several up market homes in inner city Brisbane, including one in a multi-million dollar gated community. In between, I travelled and explored. I spent a night in a luxury High Rise overlooking the city and many more nights in a pub rooms that were no better than the back of a stock truck. I even slept in a friend’s car. It has been a wild and adventurous ride and the adventure isn’t over yet. I have plans to head to Greece, South America and Malta, the land of my birth. I want to visit Spain, Turkey and as many European countries as possible. I expect to accompany my friend as he sails from New Zealand to Australia and one day I might try International Housesitting. I have adopted the quote from the movie called Mr Magorium’s Emporium and now refer to myself as a wonder aficionado. While some people find the years when their children are grown are difficult, I love my new life. I have written a book about my marvellous year and hope my story inspires others to take a chance on a dream and try something radically new, especially in their later years. There is a whole wide wonderful world still waiting to be explored. Geocaching is explained in more detail in my book “Housesitting in Australia – Big Adventures on a Tiny Budget”. 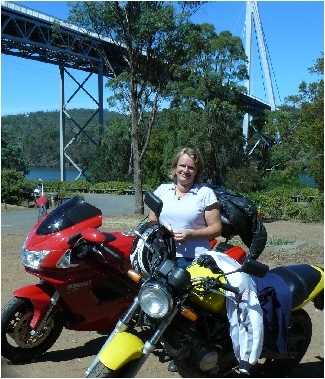 Author of “Housesitting in Australia –Big Adventures on a Tiny Budget”. Mr Magorium said it best. I am a wonder aficionado. I love life and adventure. I am a life coach, mentor, house sitter, writer and lifelong learner. I am also a grandmother and the mother of six wonderful sons. I have been exploring the East Coast of Australia on my motorbike. I am almost ready to release my new book called “Housesitting in Australia – Big Adventure on a Tiny Budget”. It is a story of my transformation from stay at home mother, to a motorbike-riding adventurer. I am very happy and I want to share that happiness with others. Thanks Nikki for this Gutsy change in your life and for sharing your adventures in Housesitting and traveling around Australia. I can think of several people who would love to start a new life, away from the “conventional” life, and this might inspire them. 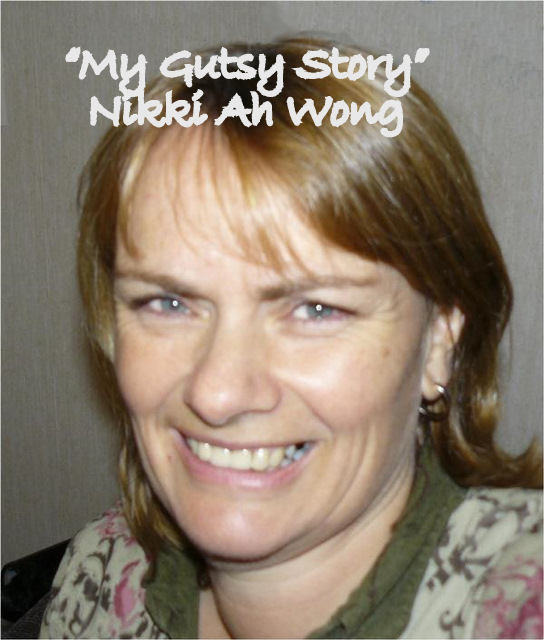 Please leave your comments and questions for Nikki Ah Wong below, and please share her” My Gutsy Story” with others who need some motivation and inspiration. Thanks so much for sharing your very “Gutsy” story and motivating so many of us to just “take charge” and go for our dreams. I have always wanted to try house-sitting, and now you’ve inspired me. I look forward to reading your book. Sonia. It has been a wild ride and so much fun that I would love to inspire more people to go for their dreams. If travel is one of your dreams, then housesitting is a great way to get around. It gets you right into the heart of a community and saves money too. You can’t get a better price than free. What a lovely story. Most people don’t realize the sense of freedom a motorcycle rider feels. Your story reminded me of that. And you had almost total freedom. You lived in the moment and can be proud of that. Thanks Marshall. That is so true about the freedom. I had no idea when I left New Zealand that a motorbike would become so much a part of my life. I guess I learned to make the most of every opportunity and to try new things. My other big lesson was to travel light. My possesions had become a drain on my time and only relationships mattered. It was freedom for sure. Yet another amazing and inspiring story! Thanks Lady Fi. I love your name and I loved the photos on your blog. They have dramatic lighting and great focus. Wow! Although I’ve had (and am having)some wild rides living and traveling in many exotic countries, I’ve never done it alone. You are a gutsy lady for sure. Wishing you luck in your further travels! PS: Try Africa! Hi Miss Footloose, (another great name), I would love to try Africa. Australia is such a wide a varied continent that it would take a lifetime to explore, but I really would love to travel further as time permits. I have not come across any housesitting jobs in Africa yet but I will keep a look out. It is a great way to travel. Thanks Kellie. I appreciate your comments. Can’t wait to read your book, Nikki. You’ve certainly led a very interesting and challenging life up to now – and I get the impression that it’s going to stay exciting and full of adventure! Thanks Stephanie. Yes, I have plans to head off again soon. The trick is in deciding where I should go next. There are so many options. I want to see everything. I see you have a French blog. I have only spent a few days in France. I would love to go back. Thanks for the link to Anuna on your blog, it is lovely. Nikki, you should visit Finland! In the wintertime it’s beautiful in Lapland and summertime is beautiful anywhere here, by the sea, lake or forest! ps. Sonia, thanks for your comment. I’ve been so busy with my new temptation: painting, drawing. I’m renting a room for December to have a space of my own, no need to tidy up…my room is too small to have many works to do at the same time. Yes, I paint/draw more than one, one’s drying and I can start a new one..
BLOGitse recently posted..ARS 11 – contemporary art in Kiasma, Helsinki 2. Finland would be a great place to visit. I will keep an eye on your blog while I am deciding. The photos are brilliant and I love that you paint and draw too. I have done some painting but not for a while. I must get back to it. Looking forward to the film with Meryl Streep playing you. PS/ e-mail me as to how to vote for you. I think you might be interested in my latest blog called “Experiencing Christmas.” It is about the diver in me. It was my dad that got me started all those years ago. Sorry, wrong blog post attached. Maybe this one? You appear to be the cover girl for Gutsy. You certainly get around and have done/accomplished a dizzying number of things. I can relate to the housesitting in a foreign country. When I first came to the U.S., I was housesitting in Santa Fe, New Mexico for a year, and it was quite an experience. Drew the line when asked to share my bed with a basset hound. I also admire your gutsiness to take a midlife upheaval and move from New Zealand to Australia, and in essence, make a new start at 50. Keep going. There are probably plenty of new adventures ahead for you. Those are kind words Penelope and it sounds like you have been gutsy yourself. We all have adventures left in us. I can’t wait to see what else life has for me. The Bassett hound sounds like a tough bedfellow. At one of my homes I was told the dogs usually slept on the bed but I didn’t need to let them. They were two cute little maltese terriers and they had a sling bed each and dozens of pillows and cushions for their comfort all around the house. They still ended up on my bed. I am just a softie. What a wonderful story. It demonstrates that we can do just about anything we want to do; that we can change our lives completing. Kudos to you. Keep up the great adventure. I have found that as I have grown older I am more open to change. I love that we can keep growing and learning all our lives. Nikki, you are forgiven for abandoning me on Farmville… It’s over a year now that I first came across your blog and we started to communicate. You introduced me to this Housesitting concept which I admired so much, but was unable to get into motion here in Brazil. I’ve already expressed my admiration for your “gutsy way of life” and your interesting and easy writing style where you let the “less gutsy” participate in your adventures. Can’t wait to hear of your new adventures somewhere in the world. Keep enjoying yourself and amusing us with your points of view. Wow! What a life!!! Don’t forget to to say hello when you hit Brazil!!!! Thanks for your kind comments Birgit. I love my new life and am excited about my new book. It went on Amazon on Saturday as a Kindle version and the paperback shouldn’t be too far behind. I moved from Farmville to Gardens of Time. I am sure you are my “neighbour” there too but not sure if you are playing. I don’t watch TV so I tend to get through the games quite quickly and I am about to run out of steam on that too. I would love to visit Brazil. There are so many places on my list. Perhaps you might visit Australia. I spend time in New Zealand regularly too, I am there now, so if you come to either I would be glad to see you. Nikki, your so able to write motivational ideas. I’m an instant fan. Fred. Why thank you so much. I should be up your way real soon. I will call soon so we can arrange a time. Nikki recently posted.."Housesitting in Australia" is out on Kindle. So, why Kindle?